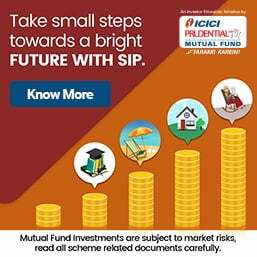 Misuse of Armed Forces Flag Day Fund, money for which is annually collected from civilians for the benefit of widows of soldiers, of disabled soldiers, sailors, airmen, ex-servicemen and their dependents, as confirmed by the audit report, has apparently resulted in profiteering for vested interest. Lack of transparency in the use of these public funds, donated by government employees and ex-servicemen on 7th December, besides voluntary donations throughout the year, has exasperated activists who are denied information under the Right to Information (RTI) Act. The Army Flag Fund has two kinds of offices: one, District Sainik Welfare Office spread over all districts that comes under the State Sainik Welfare Office, and Maharashtra Ex Servicemen Corp Ltd (MESCO), which was established in 2002 to provide large scale employment to the ex-servicemen in their home state. MESCO is headquartered in Pune. It is also pertinent to mention here that that the usage of Armed Forces Flag Day Fund is divided into two categories: Benevolent Fund, for giving grants for ex-servicemen for their children’s education, marriages and so on, and the Special Fund, used for the upkeep of estates of various Departments of Zilla Sainik Welfare (ZSW), like hostels for children of ex-servicemen and guesthouses. The proposer of the fund disbursement is the ZSW officer. The audit report in question is for the Pune’s ZSW and MESCO. As per the audit report, the District Sainik Welfare office (which disburses the funds) has been charged with indulging in irregular expenditure like purchase of vehicles, liquor served at an official function, an Air Force rally and so on. And where works are outsourced by MESCO there are issues like non-recovery of penalties from contractors, full payments to contractors without completion of work, not following tender procedure while giving out contracts, construction and civil works without administrative approval or without a demand raised by the zilla sainik welfare officer, which is mandatory. In order to procure information of the alleged financial irregularities of both the entities, Sangramsinh Gaikwad has filed 22 applications under RTI over the past two years. The information sought was regarding various constructions. MESCO’s Public Information Officer (PIO) replied that the information comprises 42,000 odd pages, copies of tender notices and misuse of Army Flag Funds and hence Gaikwad should come for inspection of files and ask for copies of specific pages. The director who is allegedly stalling information is MESCO’s managing director, Colonel Suhas Jatkar (Retd), who also hold the dual post as Director of State Sainik Welfare office and Managing Director of MESCO. 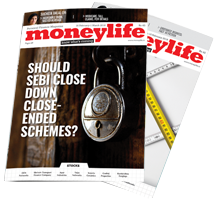 Official complaints have been made against him to the Maharashtra Chief Minister as well as the Prime Minister’s Office (PMO), due to matters arising out of his conflict of interest as he holds both the offices. This, despite a notification way back in 2003 that there should be two separate heads for both these outfits. “Allegations of siphoning of funds from ZSWs for contracts for construction through MESCO, which mostly are sub-contracted to private entities, are beyond the rules of use of Flag Day fund. There is no reason why Public Works Department (PWD) could not be used as a contractor and thus save money. Also, there are allegations that constructions are done without the respective Zilla Sainik Officer, proposing them. These irregularities have been reflected in the audit report,” he added. In the meanwhile, Commander Ravindra Pathak (retd), who has been writing fervently to various authorities, has recently shot off a complaint to the Prime Minister’s Office, against Col Jatkar, stating that the AG report has raised many observations with regard to misuse of funds. The PMO, through the Kendriya Saink Board, has asked the Chief Secretary to investigate but to date there has been no action. What is The Armed Forces Flag Day? The Armed Forces Flag Day or the Flag Day of India is a day dedicated towards collection of funds from people of India for the welfare of the Indian Armed Forces personnel. It has been observed annually in India on 7th December since 1949. Over the years, it has become a tradition to commemorate this day as an honour to the soldiers, airmen and sailors of India. Flag Day gains more significance as it considers that it is the responsibility of the civilian population of India to take care of the families and dependents of the armed forces personnel who fight for the country. Like the Kendriya Sainik Board at the Centre, the Rajya/Zila Sainik Boards are responsible for policy formulation and implementation of resettlement and welfare schemes for Ex-Servicemen, widows and their dependents residing in their respective States / UTs / Districts. To assist the Central Government in this regard, there are 32 Rajya Sainik Boards and 392 Zila Sainik Boards in the country. If the government, whether at the State or Centre, wonders why government run charity funds do not attract as much donations as private charities, this article answers that question. The Maharashtra CM Relief Fund was some years back, used to send a dance troupe overseas, rather than use the funds properly. The state government decided dancers needed the funds more than farmers who were and are still regularly committing suicide. Apparently, the moment someone occupies a seat of power in government, the disease of corruption claims him. That this disease is not allowed to be cured speaks volumes of our law makers and law enforcers. Maharashtra Chief Minister Devendra Fadnavis while announcing loan waiver scheme for farmers had said that there were 813 beneficiaries from Mumbai. However, the state government has no record of any such farmer covered under the Chhatrapati Shivaji Maharaj Farmers’ Welfare Scheme in Mumbai city and Mumbai suburbs, reveals a reply received under the Right to Information (RTI) Act. According to information received by activist Anil Galgali from the Public Information Officer (PIO) of Cooperation, Marketing and Textiles Department, "the government receives information from the State level Bankers Committee and according to that information, 694 farmers from Mumbai city have outstanding loans amounting to Rs45.04 crore and 119 farmers from Mumbai suburbs have a outstanding loans amounting to Rs0.12 crore on the basis of assumption. The government does not have the list of farmers with their names and the list is with the bankers." "The government does not have any list on its records and without cross verification and due diligence by the authorities, CM Fadnavis was given the data on assumption is a very serious lapse in the administration front," Galgali says. In July, the CM released list of beneficiary farmers on Twitter that included 694 farmers from Mumbai and 119 from Mumbai suburbs. These were the farmers from a list of beneficiaries eligible for the Rs34,000 crore loan waiver scheme announced by the state government. Just like any other country that has implemented the Right to Information law, Australia too has not hesitated to keep secret, information of vital public interest. Information sought under Australia’s RTI, pertaining to the copy of the ‘agreement’ between Gautam Adani’s company regarding the $16 billion investment and Australia’s Queensland Treasury, has been denied. In the meanwhile, massive, organised protests by hundreds of social forums continue across Australia, as a sequel to the government giving the nod recently for this controversial mining project, purported to be one of the biggest in the world. 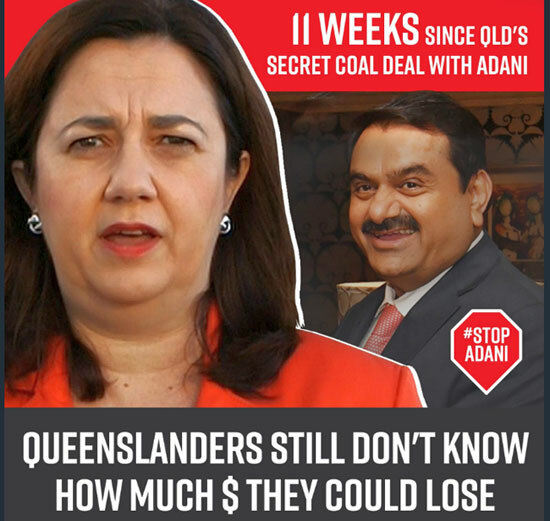 Gautam Adani’s Carmichael Mining Project in Queensland, to be developed over one lakh acres, includes construction of a 310 kms rail line and would adversely affect thousands of acres of flora, fauna and, most importantly, the Great Barrier Reef. 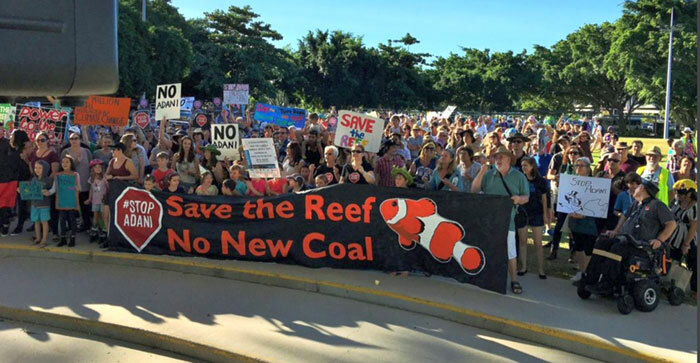 The highlight of the controversy is the protest with hashtag #stopAdani challenge over the one billion dollar money that has been allegedly given by the Australian government as loan for building Adani’s coal-carting rail network from ecologically sensitive Galillee Basin to the Great Barrier Reef. Earlier, the Australian government had publicly stated that the Adani project would have to stand on its own feet. Recently, renowned Energy consultant, Adam Walters, who was part of the Australia Research Institute team studying the employment and economic impact of coalmines in that country, invoked RTI for procuring a copy of the agreement between Adani’s company and the Queensland Treasury, besides other information pertaining to this project. A news report on 1 August 2017 in The Guardian, which has been closely following this issue, has stated that “almost all the information was either refused or redacted”. As per the report, employment generation in coalmines is negligible. “As the coal industry is capital intensive, and a small employer, the impact of a moratorium on building new coal mines on employment in Australia is even smaller than the impact on GDP. While the impact on employment is so small as to be imperceptible in the main chart, the difference in employment peaks at 0.04% in 2030, before the gap closes again as more labour intensive industries expand,” it added. “Official statistics show that the coal industry employs few Australians, accounts for a small portion of government revenues and works mainly in the interests of its overseas owners. Our modelling exercise shows that for the Australian economy and community, the impacts of a phase-out of the coal industry would be minimal. Australia can and should impose a moratorium on new coal mines and mine expansions, as part of climate and wider environmental policy, and should expect minimal economic disruption from doing so,” the Report from Australian Conservation Foundation added. According to the records of the proceedings of 24 May 2017, during the first session of the 55th Parliament, Adani’s project was the main issue discussed. How come mum’s the word in India in the Parliament as well as in the media when Australia is agog with this controversy that claims to give thousands of jobs – totally exaggerated say Australian NGOs and media. This news from Australia has proved that Indians have their their record of mines scam intercontinental.